I was absolutely thrilled to bits to be asked to make Stacey and Steve’s wedding cake – I made Stacey’s Sister’s wedding cake back in 2015, so it really is the best kind of referral you can get! 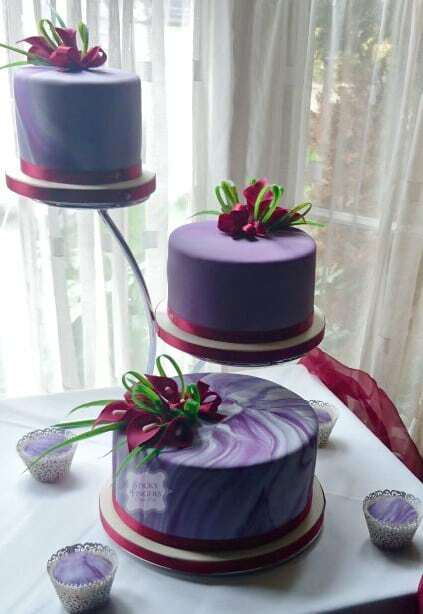 They wanted something really different so chose to have a purple and ivory marble effect icing on their wedding cake which I decorated with burgundy sugar calla lilies with artificial bear grass – very Halloweeny! The cakes were displayed on an asymmetric cake stand which they’d bought. Yummy flavours of Lemon Limoncello, Salted Caramel and Strawberry & Champagne. Massive congratulations to you both on your beautiful wedding, hope you had the most magical of days!